Mabeline was turned in to the Humane Society after being found covered in ticks and fleas and badly bitten by another dog/dogs. She is completely blind due to untreated dry eye and will require eye drops and/or eye gel daily for the rest of her life. She is a very sweet and quiet girl who is house and crate trained and walks very nicely on a lead and LOVES to ride in the car! She gets along with other dogs, and all nice people. She is healing from the dog bites on her back and shoulders and has an ear hematoma that may require some additional treatment. Mabeline is very smart, and quickly learned "step up" and "step down"! 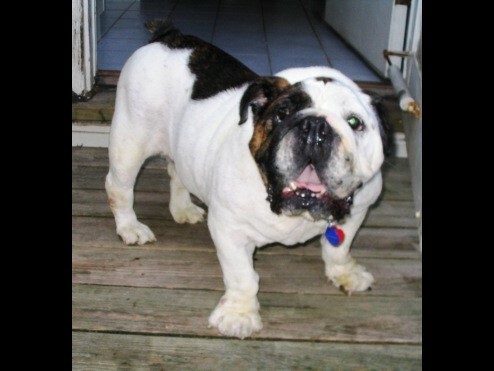 She will need a home that is stable and aware of her disability, but who will treasure her for the darling Bullie girl that she is! She is very loving and affectionate. She really likes her fluffy toys! Please be sure to have an application filled out before contacting us. We will only adopt within a 1 hour radius of St. Louis MO, and would prefer a home with exerperience with a special needs dog. Home check, references, vet references and adoption fee apply.